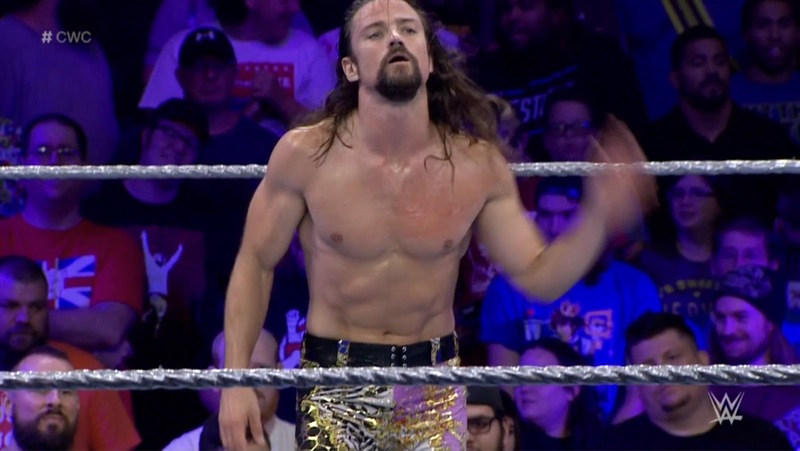 Last week's Cruiserweight Classic was the best so far, so as the second half of the tournament began, could the likes of Akira Tozawa, Jack Gallagher and Tony Nese improve on the previous week's outing? In this episode's main event, The Brian Kendrick and NYWC's Tony Nese produce a strong bout with a split crowd. Both men played to their strengths and what we got was psychologically sound encounter, that set it's shop out well in the opening stages and built on it throughout the match. The idea that Nese was the quicker and stronger competitor was presented early as Kendrick ran straight into a knee and dominated the early going including a slick sequence leading into a superkick on the outside. On the other side of the coin, Kendrick reverted to the gritty veteran role quickly, doing everything and anything to take control after initially fish-hooking Nese's mouth. Pushing the Premier Athlete's arm inside the turnbuckle pad (which is much larger than WWE's regular pad) is one of the most intelligent spots of the tournament so far. Once the story was set-up, the pair put on some real quality wrestling inside of it, mostly going back and forth with Kendrick locking in submissions and Nese get a number of near falls. A section of the bout were Kendrick locked on a cross armbreaker and Nese escaped with a series of blows to the back of the neck had more than just a hint of an MMA influence, in a contest that was one of the most varied of the CWC to this point. The build towards the conclusion was done neatly, introducing Kendrick's Bully Choke, initially having Nese power out of the hold in a dramatic sequence, before The Post-Apocalptic Scavenger was able to take advantage of a missed 450 splash and pick the victory after Nese submitted almost instantly. A clever wrestling match to close the show with Kendrick moving onto a Quarter Final match with DDT's Kota Ibushi. Whilst Kendrick v Nese was a good main event, the match of the show for me was Dragon Gate's Akira Tozawa taking on FSW's Jack Gallagher. The contest unfolded brilliantly with the popular Gallagher ruling the initial exchanges, tying Big Over into knots and generally being a bit of a cheeky chappy. This would infuriate Tozawa who fired back with a series of big strikes and getting more and more aggressive in his demeanor as Gallagher continued to entertain the crowd with his technical submission style. Similar in it's set to the main event, the story of both competitors styles was presented early with both guys getting a chance to demonstrate their approach, before the rest of the match would build on those foundations and continue to run with that psychology throughout. Whilst Gallagher's lively style had most of the crowd on his side, Tozawa's performance was definitely that of a star. The Extraordinary Gentleman would strategically work over Tozawa's knee and Big Over sold it for all that he was worth. Seriously, the former Open the Brave Gate Champion was brilliant here, not just selling when Gallagher had moves locked in, but whenever he was on a roll himself. A charging bicycle kick where Tozawa grabbed his knee immediately got a big grin and a double thumbs up from me. The final stretch astutely brought elements of the bout together as Gallagher caught Tozawa with a heel hook after the latter had shouted to the crowd, before a deadlift German suplex attempt from Tozawa was initially countered by the Mat Wizard by grabbing hold of the injured knee, with the 31 one year old from Japan powering through to get the win adding a lovely bridge to his suplex. Tozawa goes on to face CMLL's Gran Metalik in the Quarter Final. Rounding out the action this week was ICW's Noam Dar taking on ZERO1 Hong Kong's Ho Ho Lun in the best outing for both competitors in the tournament so far. After disappointing showings in the 1st Round, the crowd was cold to both guys, but definitely had begun to warm to, at least, Dar by the close of the contest. However, for me, whilst this was a solid contest, I felt that it suffered from coming straight after the Tozawa v Gallagher match, with which it had a number of similarities. Dar worked the knee well, but whilst HHL sold the injury consistently I found his selling a little bit hammy, especially with the instant comparison to Tozawa earlier in the show. The moment where HHL was unable to maintain the bridge from a Fisherman's suplex was well performed however and probably the best work HHL has done in WWE, alongside a tasty Michonoku Driver near fall. A much more aggressive Dar would claim the victory with the Champagne Super Knee Bar to earn a Quarter Final bout against either Zack Sabre Jr or Drew Gulak. Following last week's breakout episode for the show, this week maintained that momentum with a very good hour of wrestling TV. A slight drop in quality from last week, but with more action on display, this is well worth the watch. The Cruiserweight Classic has been the best show WWE has to offer ever since hitting the 2nd Round, with next week's episode bringing Round 2 to a close and featuring Zack Sabre Jr, Johnny Gargano and Rich Swann in action could we see the best episode yet next week?